Earlier this month, potter friends Carolyn and Holly and I drove down to Floyd, Virginia, for the open studios of the 16 Hands potters, looking for inspiration. 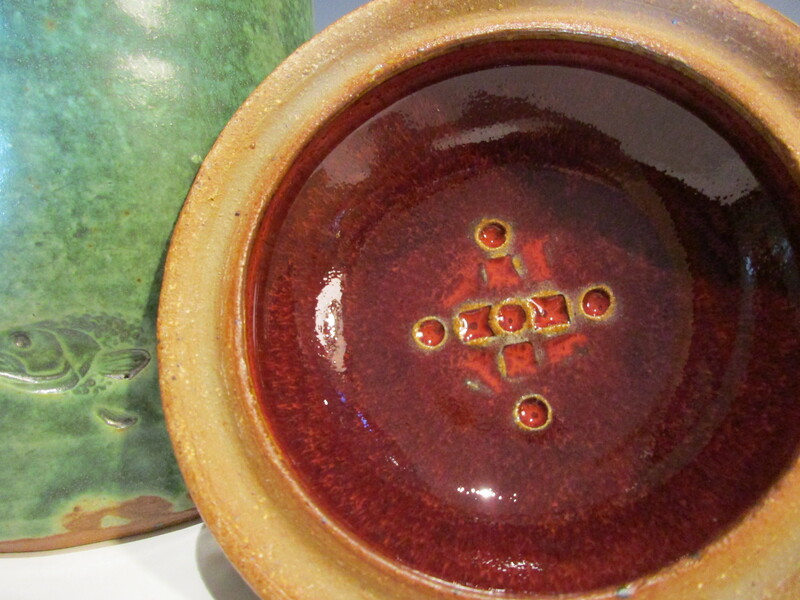 We visited the studios of eight potters (do the math) plus a a few of their invited artist friends. 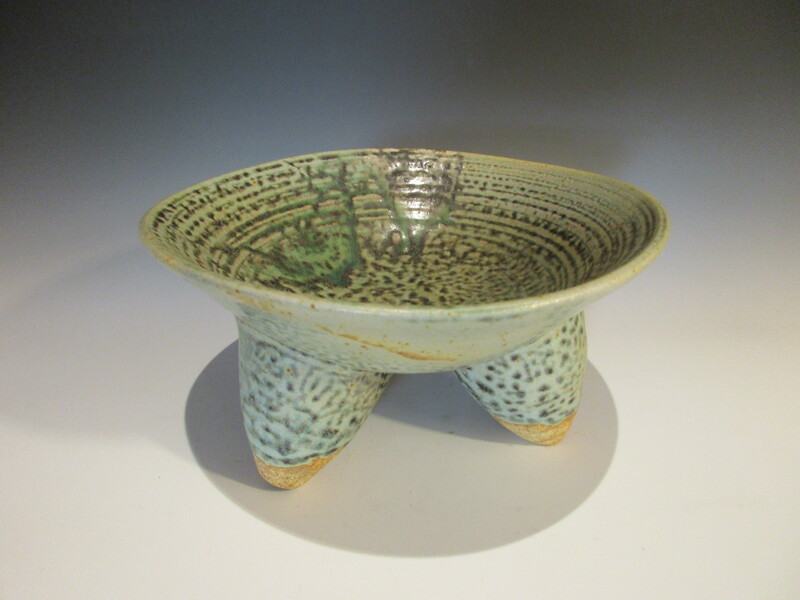 This piece is by Elisa Di Feo, who works with her potter partner in a fantastic little place. This cup got to me after I walked away a few times. 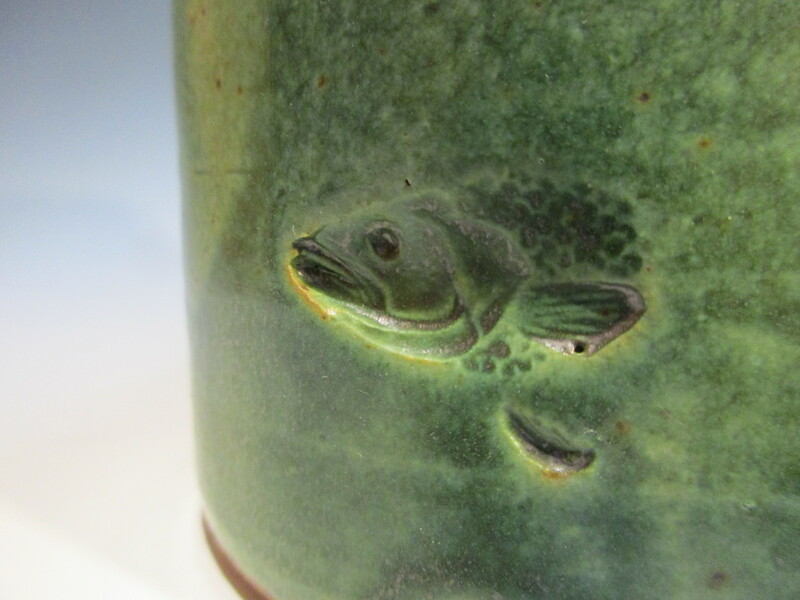 The blue underglaze crayon scratches are childish, but the fine etched lines are very grown up. A fine edge separates matte and shiny surfaces, both white. Floyd is worth the trip for the rolling Blue Ridge mountain landscape, the steady sounds of local music, the fertile creativity with clay. 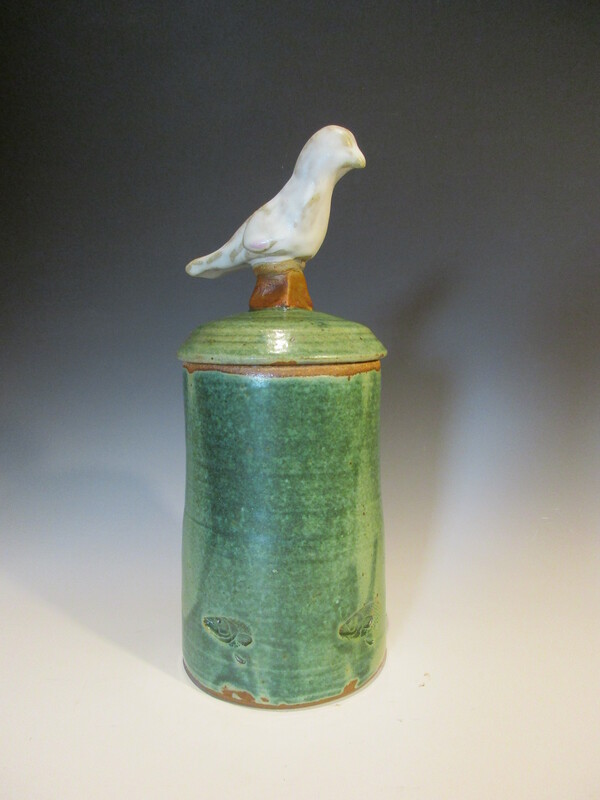 A small baker with oceanic traces, glazed in celadon and opal blue, with unglazed handles. The provenance of the shell is Assateague Island, not that it matters. Lots of little bowls, for garlic, cinnamon, curry, mahlab, zaatar. Whatever you’ve got. Various glazes. Photo by me December 2015. These and pieces like these will be for sale at the Upshur Street Craft Market on Saturday. Three vessels in Laura’s green, three feet each. Do the math. One jar with two lids. Why? You want the finished piece to have the best elements in combination. 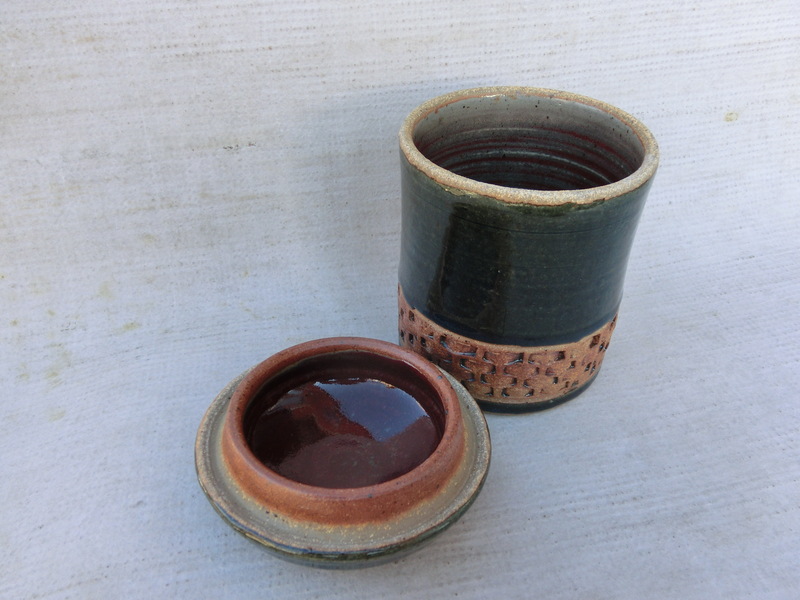 If I made one lid, or one handle for a jar or mug, what are the chances that that one would fit or be proportional? Make an extra (or two, or three). In this case I just finished both lids, bear and bird. 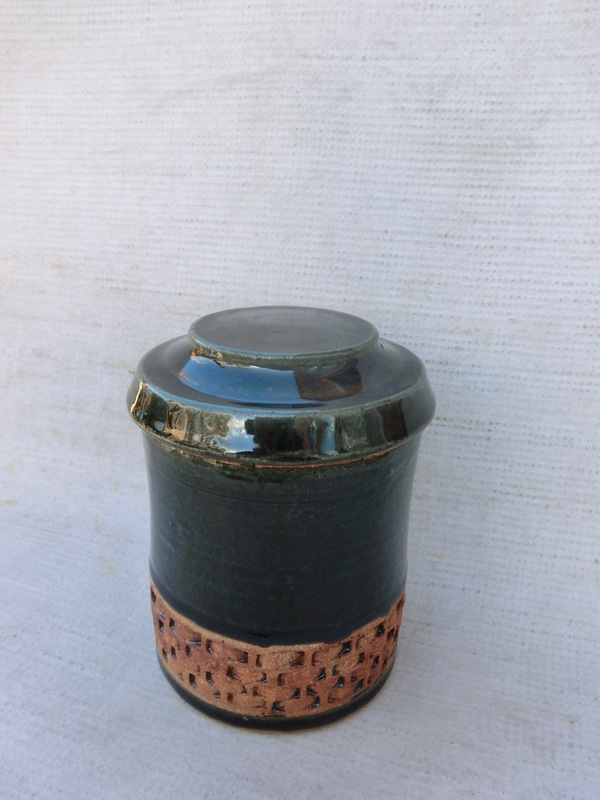 The green pot and lid have Pinnell’s Red Orange inside. I think I copied this from an ancient tripod piece I saw once. Laura’s Turquoise glaze to cone 10, cutting to gray/black. 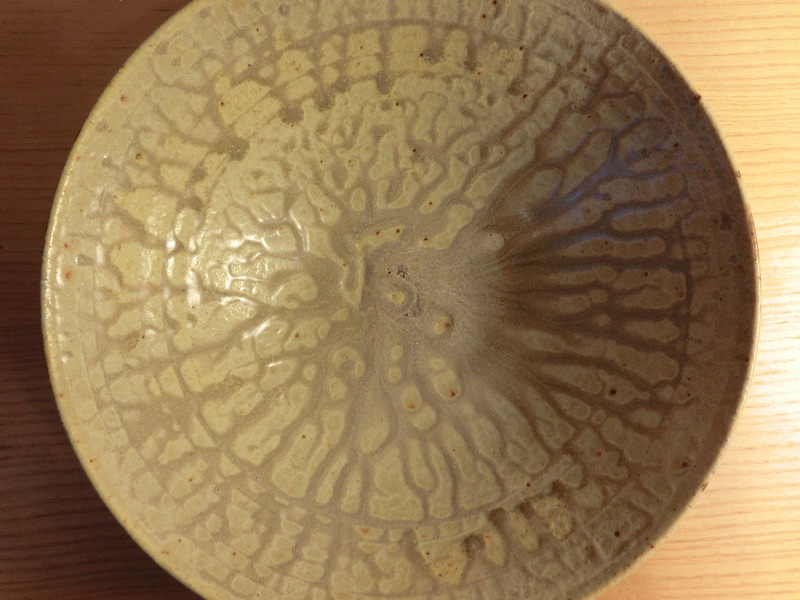 Ash glaze bowl, top and bottom. With a bit of that blingy Pinnell’s red. 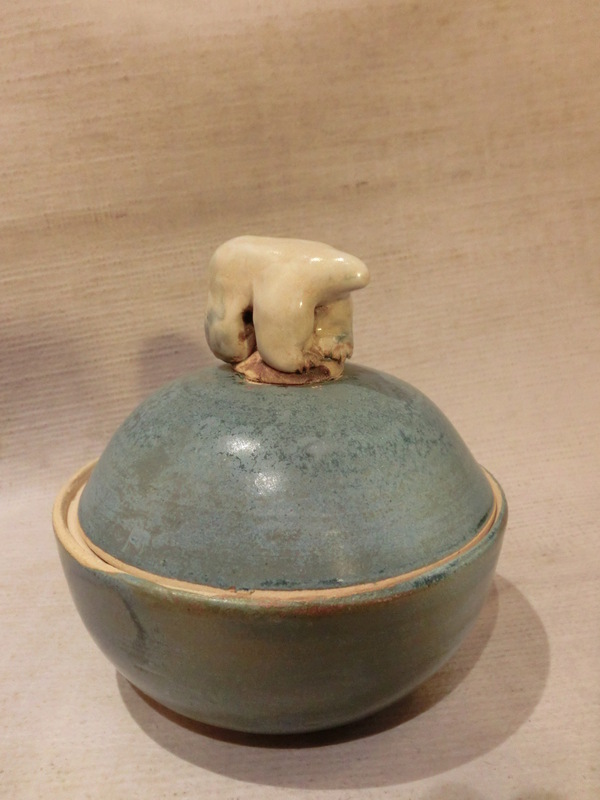 This covered jar/bowl is seven inches tall at the shoulders, standing on an eight-inch broad frozen sea. 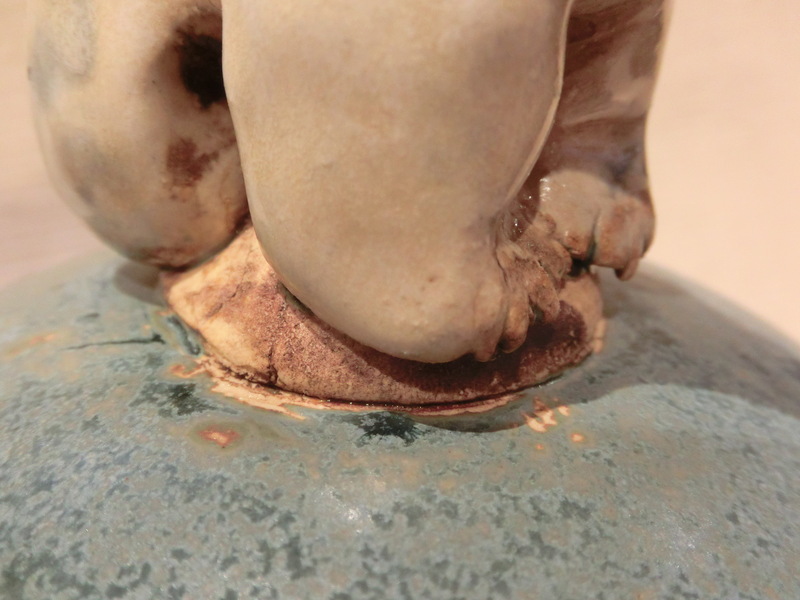 Detail of its precarious footing. 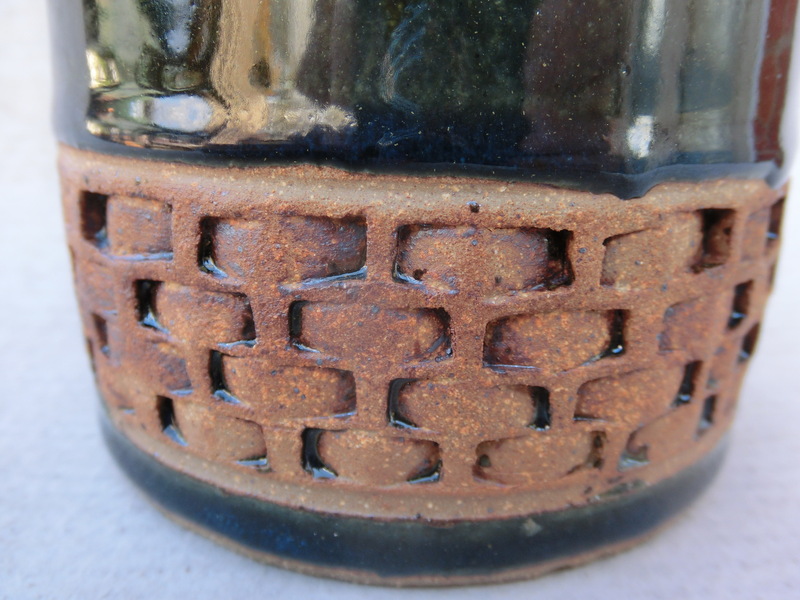 This is a detail of the woven clay pattern. I think when I first made a woven pot, I had not seen this trick before. 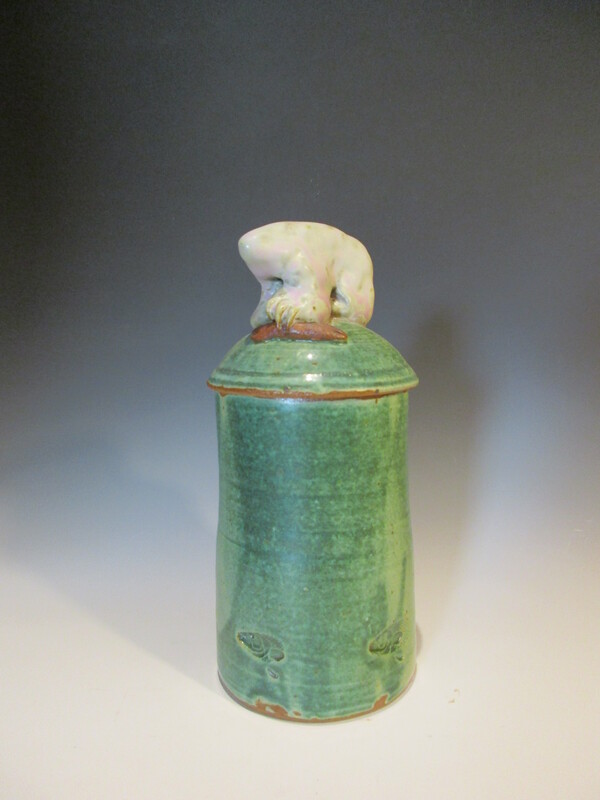 In fact, several experienced potters, teachers, have had to ask how I did it. I will show, but I will not tell. The deep blue jar has a nicely fitting lid. 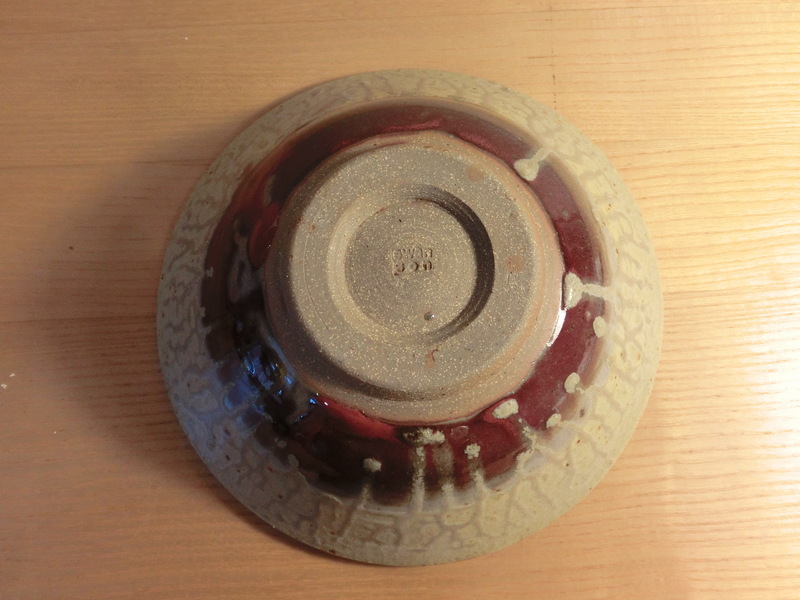 The inside of the jar and the lid are glazed in red.